The Birthday of the Infanta was published in 1891 in Oscar Wilde's second collection of fairy tales for children, A House of Pomegranates. The father of a hunchback dwarf sells him to the palace for the King of Spain's only daughter's amusement on her twelfth birthday. 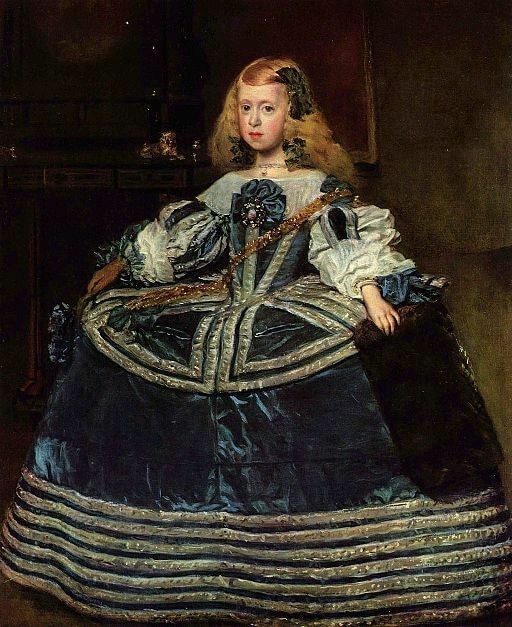 Although she was a real Princess and the Infanta of Spain, she had only one birthday every year, just like the children of quite poor people, so it was naturally a matter of great importance to the whole country that she should have a really fine day for the occasion. And a really fine day it certainly was. The tall striped tulips stood straight up upon their stalks, like long rows of soldiers, and looked defiantly across the grass at the roses, and said: We are quite as splendid as you are now. The purple butterflies fluttered about with gold dust on their wings, visiting each flower in turn; the little lizards crept out of the crevices of the wall, and lay basking in the white glare; and the pomegranates split and cracked with the heat, and showed their bleeding red hearts. Even the pale yellow lemons, that hung in such profusion from the mouldering trellis and along the dim arcades, seemed to have caught a richer colour from the wonderful sunlight, and the magnolia trees opened their great globe-like blossoms of folded ivory, and filled the air with a sweet heavy perfume. From a window in the palace the sad melancholy King watched them. Behind him stood his brother, Don Pedro of Aragon, whom he hated, and his confessor, the Grand Inquisitor of Granada, sat by his side. Sadder even than usual was the King, for as he looked at the Infanta bowing with childish gravity to the assembling courtiers, or laughing behind her fan at the grim Duchess of Albuquerque who always accompanied her, he thought of the young Queen, her mother, who but a short time before - so it seemed to him - had come from the gay country of France, and had withered away in the sombre splendour of the Spanish court, dying just six months after the birth of her child, and before she had seen the almonds blossom twice in the orchard, or plucked the second year's fruit from the old gnarled fig-tree that stood in the centre of the now grass-grown courtyard. So great had been his love for her that he had not suffered even the grave to hide her from him. She had been embalmed by a Moorish physician, who in return for this service had been granted his life, which for heresy and suspicion of magical practices had been already forfeited, men said, to the Holy Office, and her body was still lying on its tapestried bier in the black marble chapel of the Palace, just as the monks had borne her in on that windy March day nearly twelve years before. Once every month the King, wrapped in a dark cloak and with a muffled lantern in his hand, went in and knelt by her side, calling out, 'Mi reina! Mi reina!' and sometimes breaking through the formal etiquette that in Spain governs every separate action of life, and sets limits even to the sorrow of a King, he would clutch at the pale jewelled hands in a wild agony of grief, and try to wake by his mad kisses the cold painted face. Certainly he had loved her madly, and to the ruin, many thought, of his country, then at war with England for the possession of the empire of the New World. He had hardly ever permitted her to be out of his sight: for her, he had forgotten, or seemed to have forgotten, all grave affairs of State; and, with that terrible blindness that passion brings upon its servants, he had failed to notice that the elaborate ceremonies by which he sought to please her did but aggravate the strange malady from which she suffered. When she died he was, for a time, like one bereft of reason. Indeed, there is no doubt but that he would have formally abdicated and retired to the great Trappist monastery at Granada, of which he was already titular Prior, had he not been afraid to leave the little Infanta at the mercy of his brother, whose cruelty, even in Spain, was notorious, and who was suspected by many of having caused the Queen's death by means of a pair of poisoned gloves that he had presented to her on the occasion of her visiting his castle in Aragon. Even after the expiration of the three years of public mourning that he had ordained throughout his whole dominions by royal edict, he would never suffer his ministers to speak about any new alliance, and when the Emperor himself sent to him, and offered him the hand of the lovely Archduchess of Bohemia, his niece, in marriage, he bade the ambassadors tell their master that the King of Spain was already wedded to Sorrow, and that though she was but a barren bride he loved her better than Beauty; an answer that cost his crown the rich provinces of the Netherlands, which soon after, at the Emperor's instigation, revolted against him under the leadership of some fanatics of the Reformed Church. His whole married life, with its fierce, fiery-coloured joys and the terrible agony of its sudden ending, seemed to come back to him to-day as he watched the Infanta playing on the terrace. She had all the Queen's pretty petulance of manner, the same wilful way of tossing her head, the same proud curved beautiful mouth, the same wonderful smile - vrai sourire de France indeed - as she glanced up now and then at the window, or stretched out her little hand for the stately Spanish gentlemen to kiss. But the shrill laughter of the children grated on his ears, and the bright pitiless sunlight mocked his sorrow, and a dull odour of strange spices, spices such as embalmers use, seemed to taint - or was it fancy? - the clear morning air. He buried his face in his hands, and when the Infanta looked up again the curtains had been drawn, and the King had retired. She made a little moue of disappointment, and shrugged her shoulders. Surely he might have stayed with her on her birthday. What did the stupid State-affairs matter? Or had he gone to that gloomy chapel, where the candles were always burning, and where she was never allowed to enter? How silly of him, when the sun was shining so brightly, and everybody was so happy! Besides, he would miss the sham bull-fight for which the trumpet was already sounding, to say nothing of the puppet show and the other wonderful things. Her uncle and the Grand Inquisitor were much more sensible. They had come out on the terrace, and paid her nice compliments. So she tossed her pretty head, and taking Don Pedro by the hand, she walked slowly down the steps towards a long pavilion of purple silk that had been erected at the end of the garden, the other children following in strict order of precedence, those who had the longest names going first. A procession of noble boys, fantastically dressed as toreadors, came out to meet her, and the young Count of Tierra-Nueva, a wonderfully handsome lad of about fourteen years of age, uncovering his head with all the grace of a born hidalgo and grandee of Spain, led her solemnly in to a little gilt and ivory chair that was placed on a raised da's above the arena. The children grouped themselves all round, fluttering their big fans and whispering to each other, and Don Pedro and the Grand Inquisitor stood laughing at the entrance. Even the Duchess - the Camerera-Mayor as she was called - a thin, hard-featured woman with a yellow ruff did not look quite so bad-tempered as usual, and something like a chill smile flitted across her wrinkled face and twitched her thin bloodless lips. It certainly was a marvellous bullfight, and much nicer, the Infanta thought, than the real bull-fight that she had been brought to see at Seville, on the occasion of the visit of the Duke of Parma to her father. Some of the boys pranced about on richly-caparisoned hobby-horses brandishing long javelins with gay streamers of bright ribands attached to them; others went on foot waving their scarlet cloaks before the bull, and vaulting lightly over the barrier when he charged them; and as for the bull himself he was just like a live bull, though he was only made of wicker-work and stretched hide, and sometimes insisted on running round the arena on his hind legs, which no live bull ever dreams of doing. He made a splendid fight of it too, and the children got so excited that they stood up upon the benches, and waved their lace handkerchiefs and cried out: Bravo toro! Bravo toro! just as sensibly as if they had been grown-up people. At last, however, after a prolonged combat, during which several of the hobby-horses were gored through and through, and their riders dismounted, the young Count of Tierra-Nueva brought the bull to his knees, and having obtained permission from the Infanta to give the coup de grace, he plunged his wooden sword into the neck of the animal with such violence that the head came right off and disclosed the laughing face of little Monsieur de Lorraine, the son of the French Ambassador at Madrid. The arena was then cleared amidst much applause, and the dead hobby-horses dragged solemnly away by two Moorish pages in yellow and black liveries, and after a short interlude, during which a French posture-master performed upon the tight rope, some Italian puppets appeared in the semi-classical tragedy of Sophonisba on the stage of a small theatre that had been built up for the purpose. They acted so well, and their gestures were so extremely natural, that at the close of the play the eyes of the Infanta were quite dim with tears. Indeed some of the children really cried, and had to be comforted with sweetmeats, and the Grand Inquisitor himself was so affected that he could not help saying to Don Pedro that it seemed to him intolerable that things made simply out of wood and coloured wax, and worked mechanically by wires, should be so unhappy and meet with such terrible misfortunes. An African juggler followed, who brought in a large flat basket covered with a red cloth, and having placed it in the centre of the arena, he took from his turban a curious reed pipe, and blew through it. In a few moments the cloth began to move, and as the pipe grew shriller and shriller two green and gold snakes put out their strange wedge-shaped heads and rose slowly up, swaying to and fro with the music as a plant sways in the water. The children, however, were rather frightened at their spotted hoods and quick darting tongues, and were much more pleased when the juggler made a tiny orange-tree grow out of the sand and bear pretty white blossoms and clusters of real fruit; and when he took the fan of the little daughter of the Marquess de Las-Torres, and changed it into a blue bird that flew all round the pavilion and sang, their delight and amazement knew no bounds. The solemn minuet, too, performed by the dancing boys from the church of Nuestra Senora Del Pilar, was charming. The Infanta had never before seen this wonderful ceremony which takes place every year at May-time in front of the high altar of the Virgin, and in her honour; and indeed none of the royal family of Spain had entered the great cathedral of Saragossa since a mad priest, supposed by many to have been in the pay of Elizabeth of England, had tried to administer a poisoned wafer to the Prince of the Asturias. So she had known only by hearsay of 'Our Lady's Dance,' as it was called, and it certainly was a beautiful sight. The boys wore old-fashioned court dresses of white velvet, and their curious three-cornered hats were fringed with silver and surmounted with huge plumes of ostrich feathers, the dazzling whiteness of their costumes, as they moved about in the sunlight, being still more accentuated by their swarthy faces and long black hair. Everybody was fascinated by the grave dignity with which they moved through the intricate figures of the dance, and by the elaborate grace of their slow gestures, and stately bows, and when they had finished their performance and doffed their great plumed hats to the Infanta, she acknowledged their reverence with much courtesy, and made a vow that she would send a large wax candle to the shrine of Our Lady of Pilar in return for the pleasure that she had given her. A troop of handsome Egyptians - as the gipsies were termed in those days - then advanced into the arena, and sitting down cross-legs, in a circle, began to play softly upon their zithers, moving their bodies to the tune, and humming, almost below their breath, a low dreamy air. When they caught sight of Don Pedro they scowled at him, and some of them looked terrified, for only a few weeks before he had had two of their tribe hanged for sorcery in the marketplace at Seville, but the pretty Infanta charmed them as she leaned back peeping over her fan with her great blue eyes, and they felt sure that one so lovely as she was could never be cruel to anybody. So they played on very gently and just touching the cords of the zithers with their long pointed nails, and their heads began to nod as though they were falling asleep. Suddenly, with a cry so shrill that all the children were startled and Don Pedro's hand clutched at the agate pommel of his dagger, they leapt to their feet and whirled madly round the enclosure beating their tambourines, and chaunting some wild love-song in their strange guttural language. Then at another signal they all flung themselves again to the ground and lay there quite still, the dull strumming of the zithers being the only sound that broke the silence. After that they had done this several times, they disappeared for a moment and came back leading a brown shaggy bear by a chain, and carrying on their shoulders some little Barbary apes. The bear stood upon his head with the utmost gravity, and the wizened apes played all kinds of amusing tricks with two gipsy boys who seemed to be their masters, and fought with tiny swords, and tired off guns, and went t!trough a regular soldier's drill just like the King's own bodyguard. In fact the gipsies were a great success. But the funniest part of the whole morning's entertainment, was undoubtedly the dancing of the little Dwarf. When he stumbled into the arena, waddling on his crooked legs and Wagging his huge misshapen head from side to side, the children went off into a loud shout of delight, and the Infanta herself laughed so much that the Camerera was obliged to remind her that although there were many precedents in Spain for a King's daughter weeping before her equals, there were none for a Princess of the blood royal making so merry before those who were her inferiors in birth. The Dwarf however, was really quite irresistible, and even at the Spanish Court, always noted for its cultivated passion for the horrible, so fantastic a little monster had never been seen. It was his first appearance, too. He had been discovered only the day before, running wild through the forest, by two of the nobles who happened to have been hunting in a remote part of the great cork-wood that surrounded the town, and had been carried off by them to the Palace as a surprise for the Infanta, his father, who was a poor charcoal-burner, being but too well pleased to get rid of so ugly and useless a child. Perhaps the most amusing thing about him was his complete unconsciousness of his own grotesque appearance. Indeed he seemed quite happy and full of the highest spirits. When the children laughed, he laughed as freely and as joyously as any of them, and at the close of each dance he made them each the funniest of bows, smiling and nodding at them just as if he was really one of themselves, and not a little misshapen thing that Nature, in some humourous mood, had fashioned for others to mock at. As for the Infanta, she absolutely fascinated him. He could not keep his eyes off her, and seemed to dance for her alone, and when at the close of the performance, remembering how she had seen the great ladies of the Court throw bouquets to Caffarelli the famous Italian treble, whom the Pope had sent from his own chapel to Madrid that he might cure the King's melancholy by the sweetness of his voice, she took out of her hair the beautiful white rose, and partly for a jest and partly to tease the Camerera, threw it to him across the arena with her sweetest smile, he took the whole matter quite seriously, and pressing the flower to his rough coarse lips he put his hand upon his heart, and sank on one knee before her, grinning from ear to ear, and with his little bright eyes sparkling with pleasure. 'And he has actually got one of my best blooms,' exclaimed the White Rose-Tree. 'I gave it to the Infanta this morning myself as a birthday present, and he has stolen it from her.' And she called out: 'Thief thief thief!' at the top of her voice. As for the old Sundial, who was an extremely remarkable individual, and had once told the time of day to no less a person than the Emperor Charles V himself, he was so taken aback by the little Dwarf's appearance, that he almost forgot to mark two whole minutes with his long shadowy finger, and could not help saying to the great milk-white Peacock, who was sunning herself on the balustrade, that everyone knew that the children of Kings were Kings, and that the children of charcoal-burners were charcoal-burners, and that it was absurd to pretend that it wasn't so; a statement with which the Peacock entirely agreed, and indeed screamed out, 'Certainly, certainly,' in such a loud, harsh voice, that the gold-fish who lived in the basin of the cool splashing fountain put their heads out of the water, and asked the huge stone Tritons what on earth was the matter. The Flowers, however, were excessively annoyed at their behaviour, and at the behaviour of the birds. 'It only shows, they said, 'what a vulgarising effect this incessant rushing and flying about has. Well-bred people always stay exactly in the same place, as we do. No one ever saw us hopping up and down the walks, or galloping madly through the grass after dragon-flies. When we do want change of air, we send for the gardener, and he carries us to another bed. This is dignified, and as it should be. But birds and lizards have no sense of repose, and indeed birds have not even a permanent address. They are mere vagrants like the gipsies, and should be treated in exactly the same manner.' So they put their noses in the air, and looked very haughty, and were quite delighted when after some time they saw the little Dwarf scramble up from the grass, and make his way across the terrace to the palace. But the little Dwarf knew nothing of all this. He liked the birds and the lizards immensely, and thought that the flowers were the most marvellous things in the whole world, except of course the Infanta, but then she had given him the beautiful white rose, and she loved him, and that made a great difference. How he wished that he had gone back with her! She would have put him on her right hand, and smiled at him, and he would have never left her side, but would have made her his playmate, and taught her all kinds of delightful tricks. For though he had never been in a palace before, he knew a great many wonderful things. He could make little cages out of rushes for the grasshoppers to sing in, and fashion the long-jointed bamboo into the pipe that Pan loves to hear. He knew the cry of every bird, and could call the starlings from the tree-top, or the heron from the mere. He knew the trail of every animal, and could track the hare by its delicate footprints, and the boar by the trampled leaves. All the wind-dances he knew, the mad dance in red raiment with the autumn, the light dance in blue sandals over the corn, the dance with white snow-wreaths in winter, and the blossom-dance through the orchards in spring. He knew where the wood-pigeons built their nests, and once when a fowler had snared the parent birds, he had brought up the young ones himself, and had built a little dovecote for them in the cleft of a pollard elm. They were quite tame, and used to feed out of his hands every morning. She would like them, and the rabbits that scurried about in the long fern, and the jays with their steely feathers and black bills, and the hedgehogs that could curl themselves up into prickly balls, and the great wise tortoises that crawled slowly about, shaking their heads and nibbling at the young leaves. Yes, she must certainly come to the forest and play with him. He would give her his own little bed, and would watch outside the window till dawn, to see that the wild horned cattle did not harm her, nor the gaunt wolves creep too near the hut. And at dawn he would tap at the shutters and wake her, and they would go out and dance together all the day long. It was really not a bit lonely in the forest. Sometimes a Bishop rode through on his white mule, reading out of a painted book. Sometimes in their green velvet caps, and their jerkins of tanned deerskin, the falconers passed by, with hooded hawks on their wrists. At vintage time came the grape-treaders, with purple hands and feet, wreathed with glossy ivy and carrying dripping skins of wine; and the charcoal-burners sat round their huge braziers at night, watching the dry logs charring slowly in the fire, and roasting chestnuts in the ashes, and the robbers came out of their caves and made merry with them. Once, too, he had seen a beautiful procession winding up the long dusty road to Toledo. The monks went in front singing sweetly, and carrying bright banners and crosses of gold, and then, in silver armour, with matchlocks and pikes, came the soldiers, and in their midst walked three barefooted men, in strange yellow dresses painted all over with wonderful figures, and carrying lighted candles in their hands. Certainly there was a great deal to look at in the forest, and when she was tired he would find a soft bank of moss for her, or carry her in his arms, for he was very strong, though he knew that he was not tall. He would make her a necklace of red bryony berries, that would be quite as pretty as the white berries that she wore on her dress, and when she was tired of them, she could throw them away, and he would find her others. He would bring her acorn-cups and dew-drenched anemones, and tiny glow-worms to be stars in the pale gold of her hair. The little Dwarf looked in wonder all round him, and was half-afraid to go on. The strange silent horsemen that galloped so swiftly through the long glades without making any noise, seemed to him like those terrible phantoms of whom he had heard the charcoal-burners speaking - the Comprachos, who hunt only at night, and if they meet a man, turn him into a hind, and chase him. But he thought of the pretty Infanta, and took courage. He wanted to find her alone, and to tell her that he too loved her. Perhaps she was in the room beyond. It was a throne-room, used for the reception of foreign ambassadors, when the King, which of late had riot been often, consented to give them a personal audience; the same room in which, many years before, envoys had appeared from England to make arrangements for the marriage of their Queen, then one of the Catholic sovereigns of Europe, with the Emperor's eldest son. The hangings were of gilt Cordovan leather, and a heavy gilt chandelier with branches for three hundred wax lights hung down from the black and white ceiling. Under-neath a great canopy of gold cloth, on which the lions and towers of Castile were broidered in seed pearls, stood the throne itself covered with a rich pall of black velvet studded with silver tulips and elaborately fringed with silver and pearls. On the second step of the throne was placed the kneeling-stool of the Infanta, with its cushion of cloth of silver tissue, and below that again, and beyond the limit of the canopy, stood the chair for the Papal Nuncio, who alone had the right to be seated in the King's presence on the occasion of any public ceremonial, and whose Cardinal's hat, with its tangled scarlet tassels, lay on a purple tabouret in front. On the wall, facing the throne, hung a life-sized portrait of Charles V in hunting dress, with a great mastiff by his side, and a picture of Philip II receiving the homage of the Netherlands occupied the centre of the other wall. Between the windows stood a black ebony cabinet, inlaid with plates of ivory, on which the figures from Holbein's Dance of Death had been graved - by the hand, some said, of that famous master himself. But the little Dwarf cared nothing for all this magnificence. He would not have given his rose for all the pearls on the canopy, nor one white petal of his rose for the throne itself What he wanted was to see the Infanta before she went down to the pavilion, and to ask her to come away with him when he had finished his dance. Here, in the Palace, the air was close and heavy, but in the forest the wind blew free, and the sunlight with wandering hands of gold moved the tremulous leaves aside. There were flowers, too, in the forest, not so splendid, perhaps, as the flowers in the garden, but more sweetly scented for all that; hyacinths in early spring that flooded with waving purple the cool glens, and grassy knolls; yellow primroses that nestled in little clumps round the gnarled roots of the oak-trees; bright celandine, and blue speedwell, and irises lilac and gold. There were grey catkins on the hazels, and the fox-gloves drooped with the weight of their dappled bee-haunted cells. The chestnut had its spires of white stars, and the hawthorn its pallid moons of beauty. Yes: surely she would come if he could only find her! She would come with him to the fair forest, and all day long he would dance for her delight. A smile lit up his eyes at the thought and he passed into the next room. 'Was it Echo? He had called to her once in the valley, and she had answered him word for word. Could she mock the eye, as she mocked the voice? Could she make a mimic world just like the real world? Could the shadow of things have colour and life and movement? Could it be that - ? 'When the truth dawned upon him, he gave a wild cry of despair, and fell sobbing to the ground. So it was he who was misshapen and hunchbacked, foul to look at and grotesque. He himself was the monster, and it was at him that all the children had been laughing, and the little Princess who he had thought loved him - she too had been merely mocking at his ugliness, and making merry over his twisted limbs. 'Why had they not left him in the forest, where there was no mirror to tell him how loathsome he was? 'Why had his father not killed hint, rather that sell him to his shame? The hot tears poured down his cheeks, and he tore the white rose to pieces. The sprawling monster did the same, and scattered the faint petals in the air. It grovelled on the ground, and, when he looked at it, it watched him with a face drawn with pain. He crept away, lest he should see it, and covered his eyes with his hands. He crawled, like some wounded thing, into the shadow, and lay there moaning. Add The Birthday of the Infanta to your own personal library.